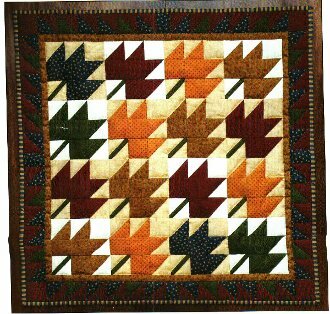 Crisp leaves in multiple colors cascade across this bright and perky wall quilt. A sawtooth border contains and complements the flurry. Construction is made simple with the use of large squares that are stitched, cut, and trimmed to create perfect triangle square units. Finished size is 22” x 22”. Kit includes all fabrics (100% cotton) for quilt top, back, and binding. Also included are batting, quilting suggestions, precise patterns and complete, illustrated instructions. Colors are red, green, blue, two shades of gold, and two shades of off-white.